Many scholars have described how urban activities, histories and identities are prescribed, controlled and homogenized. Far less attention, however, has been paid to the myriad possibilities that public space still offers people to do what they choose. Loose Space explores the continuing richness of public life that is created and sustained by urbanites themselves. With thirteen case studies from different countries, Loose Space describes the many ways that urban residents, with determination and imagination, appropriate public space to meet their needs and desires. Familiar or unexpected, spontaneous or planned, momentary or more long lasting, the activities that make urban space “loose” continue to give cities life and vitality. 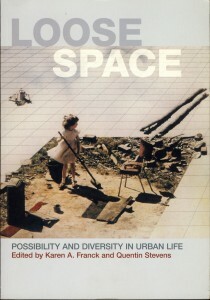 The book focuses on physical spaces and how people use them. Contributors describe recreational, commercial and political activities; some of them are conventional, others are more experimental. The activities take place in a wide variety of locations: alongside the intended uses of planned public spaces such as sidewalks and plazas, and in place of former uses, as in a vacant lots and abandoned warehouses. Discovery Social Practices, Sensual Excess and Aesthetic Transgression in Industrial Ruins.